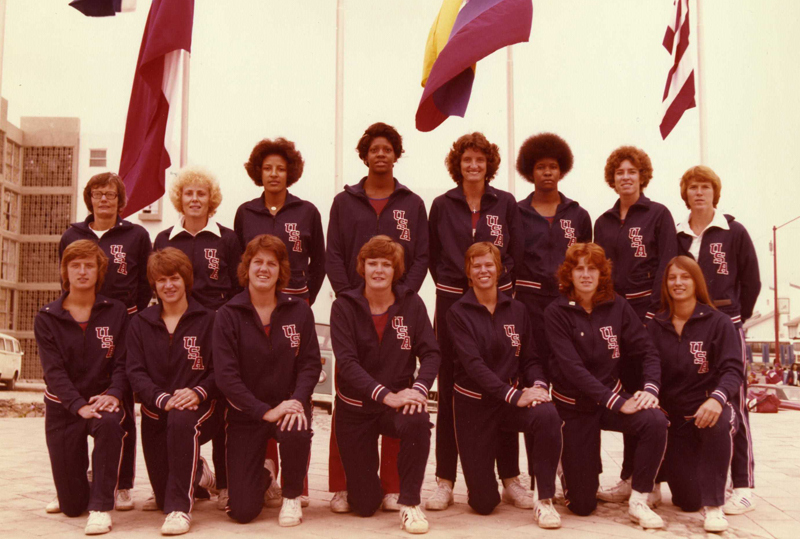 The 1975 U.S. Women’s Pan American team. Carolyn Bush Roddy is the third from the left (between Coach Cathy Rush and Lusia Harris) in the back row. USA Basketball photo. When Carolyn Bush Roddy got the call telling her she’d made it into the Women’s Basketball Hall of Fame earlier this year, she’d just gone into the local Walmart in Knoxville. 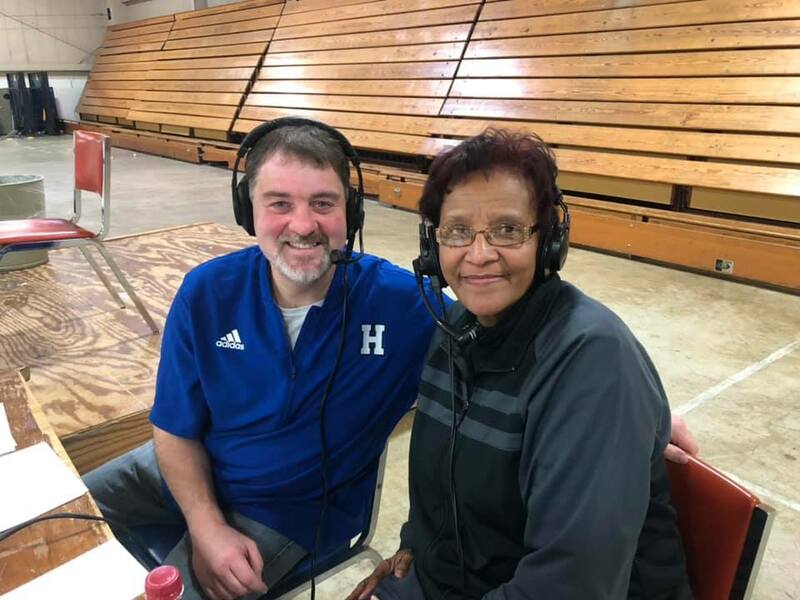 She was unable to move or say anything as Danielle Donehew, the executive director of the Women’s Basketball Coaches Association, gave her the good news. When she hung up, she couldn’t remember what she’d gone into Walmart to buy. Bush Roddy has been around the game of women’s basketball for more than 50 years. She can cite a connection to every single person who either played, coached, or officiated their way into the Women’s Basketball Hall of Fame in its first 15 years of operation (except of course for Senda Berenson, who invented the game in 1892). Finally, she’ll be joining the greats of the women’s game when she’s inducted this coming June as part of the hall’s 21st class. She moved to stationary forward her sophomore year and, at 6-2 and 145 pounds, began dominating the action. She says she owes Coach Wilson a huge debt of gratitude for helping her develop not only her skills but also her passion for the game and the discipline to achieve her goals. As an example, she cites the rough start to her freshman year in high school. She had 4 F’s, 1 C, and 2 D’s at the end of the first marking period. After the grades came out, Coach Wilson made her sit in the gym and watch the team practice while she did her homework. Every 30 minutes, he would tap her on the shoulder and ask if she wanted to play. When she answered yes, he’d tell her she couldn’t yet. This went on, she says, for two solid weeks. Bush Roddy went on to earn MVP honors in 12 different tournaments her senior year, and played in the East & West All-Star Game, held at Stokley Center on the University of Tennessee at Knoxville campus in 1971. Options for playing basketball after high school were improving around the country, but for a “country bumpkin” who didn’t want to stray too far from home, Hiwassee Junior College in nearby Madisonville, TN, which had switched to the five-player, full-court game, made sense. Her team made it to the national junior college tournament in both 1972 and 1973, which was held in Enid, Oklahoma. There, legendary coach Harley Redin of Wayland Baptist College took notice of Bush Roddy and recruited her to finish out her college career with the Flying Queens. Wayland Baptist won two AIAW consolation bracket championships during Bush Roddy’s two years there. After graduation, Bush Roddy made the Pan American team that won a gold medal in Mexico City in 1975. She started every game along with Lusia Harris, Julie Simpson, and Anne Meyers. Other members of the team were Pat Summitt, Nancy Lieberman and Sue Rocjewicz. Averaging 87 points per game and allowing opponents just over 52 points, the U.S. women went undefeated in the tournament. 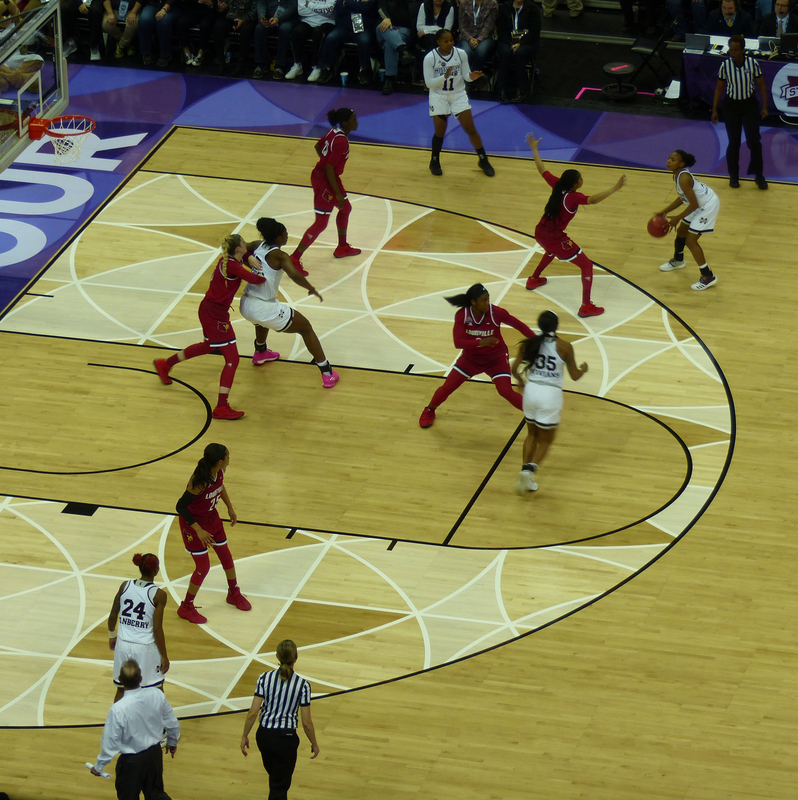 Against defending champion Brazil in the game for the gold, the U.S. won 74-55, ending a 12-year drought for the U.S. women in international play. The following year, Bush Roddy was the last person cut when USA Basketball was assembling the 1976 Olympic team. Still, she has lots of great memories of international play, including an incident in Moscow when she literally stopped traffic after she’d decided to let one of her teammates braid her hair. Bush Roddy played three seasons in the Women’s Professional Basketball League (WPBL) with the Dallas Diamonds from 1979-1981. By then she was married to her husband Steve, doing coaching clinics with Clemson’s Jim Davis and Tennessee’s Pat Summitt, and working at one of the government plants in Oak Ridge, TN. When Coach Dean Weese (who’d been her coach at Wayland Baptist) called to ask if she’d play for Dallas, she asked Steve how he’d feel about making the move. Bush Roddy attributes much of her success to her faith in God. It’s a faith instilled in her by her grandmother long ago and affirmed three years ago when she and Steve both survived battles with cancer. Three years later, they are both cancer free. Over the years, Bush Roddy has stayed involved in women’s basketball. In 1996, Bush Roddy became the assistant coach of the women’s basketballl team at Roane State Community College. A year later, she took over as Head Coach at her alma mater, Hiwassee College. From 2000-2003, she was Head Coach at Knoxville College. From 2002 through 2006, she served on the Board of Directors for the Women’s Basketball Hall of Fame. Bush Roddy has reservations about some of the changes in the women’s game. She thinks the 3-point shot is ruining the game. She thinks shooters should use the backboard more, and she believes parents shouldn’t let their kids play one sport all year round. Bush Roddy is already working on her speech for her June 8 induction. She’s going into the hall with a group that includes Ticha Penichiero, Ruth Riley, and Valerie Still. She plans to mention some of the women who’ve gone before her, thanking them for paving the way for her. This has been a good year for Doris Burke, ESPN’s first female full-time analyst on national NBA broadcasts. Burke, who turned 53 on Nov. 4, had her contract with ESPN renewed in a “multi-year” deal this past June. In September, she was honored by the Naismith Memorial Basketball Hall of Fame as the recipient of the Curt Gowdy Media Award. Though calling National Basketball Association games is the pinnacle of sorts in the broadcasting world, women’s basketball is still near and dear to Burke’s heart. Indeed, it wasn’t just the hundreds of men’s college basketball games she called, but also the decade’s worth of NCAA Division I women’s basketball Final Fours and WNBA broadcasts that convinced ESPN she had the chops for the fast-paced, weekly grind of the NBA. Burke’s ability to break things down and explain them simply probably would have made her a darn good college basketball coach. 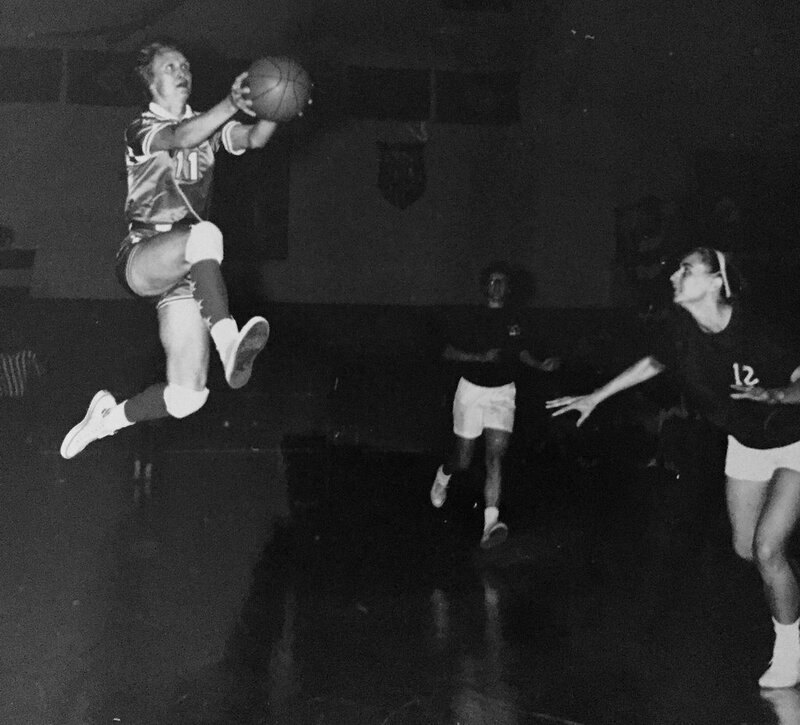 Her point guard mentality was honed having played basketball at Providence College in the mid-80s (where she is still among the team’s leaders in career assists). Soon after graduation, she returned to PC as an assistant coach, but after she got married, she decided she couldn’t be a great mom and a great basketball coach too. Instead, she started doing Lady Friars’ radio broadcasts, which led to gigs broadcasting Big East radio and TV games. 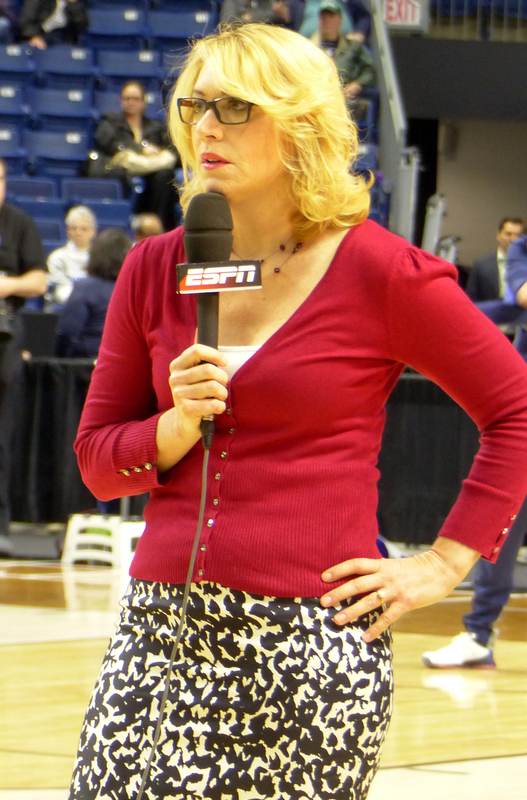 By 2003, Burke had come to the attention of ESPN, which hired her to be a sideline reporter for its men’s collegiate basketball games. It was a stereotypical position: the men in the broadcast booth analyzing the action, the woman on the sidelines humanizing the players. It bothered her, as it does many women, that for female broadcasters, the path to the top has to go through the sidelines, whereas men often go directly to the broadcast booth. But Burke’s passion for basketball and her desire to analyze games at the highest levels won out. From there, her incredible work ethic and her personable style began to pay off. Fans and players recognized her the moment she walked into an arena and approached her for a chat or a selfie. In 2016, the video game NBA 2K moved Burke up from sideline reporter to color analyst. Management finally figured out that they needed to move her up as well. The Tribune Girls basketball team, ca. 1930s. Ora Washington is third from the right. Photo courtesy of the Charles L. Blockson Collection at Temple University. In 1930, the Philadelphia Tribune Girls began a run of 11 straight “unofficial” national championships. Ora Washington, perhaps the least well-known superstar of women’s basketball, was their undisputed star. She singlehandedly raised the game to a new level, and for her accomplishments, she was inducted posthumously into the Naismith Memorial BHOF this past weekend. In Finding A Way to Play, the Pioneering Spirit of Women’s Basketball, I devoted a big chunk of my chapter on African-American exploits in the early days of women’s basketball to Washington. Her story is an amazing one that deserves to be more widely known. Like many blacks, she came north to Philadelphia from the South during the Jim Crow era. The first sport she mastered was tennis and she made a national name for herself in that sport during the 1930s and 40s. She was recruited to play basketball in her spare time by the local black women’s team, the Germantown Hornets. Another team, the Philadelphia Tribune Girls lured Washington and her tennis partner away from the Hornets in 1932. That’s when the Tribune Girls really began to take off and make a name for themselves. 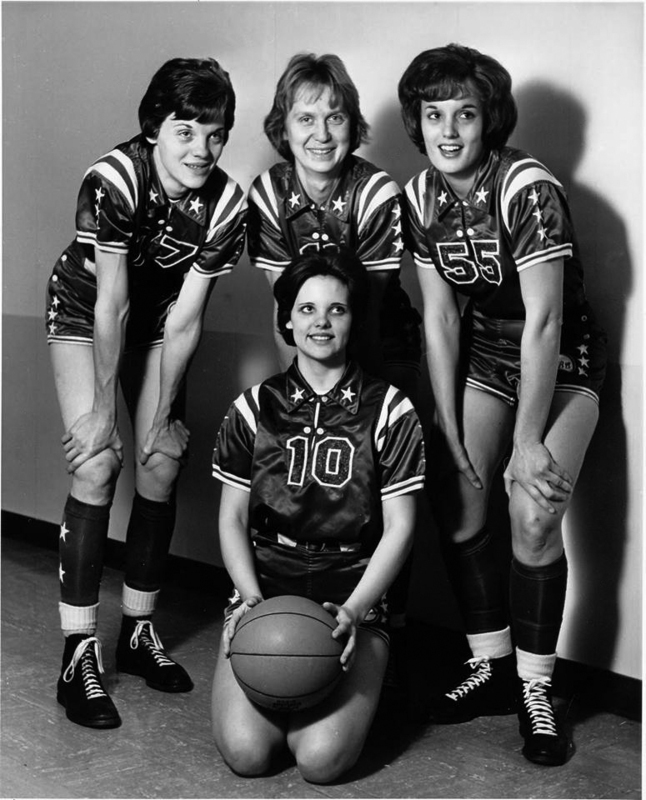 The Tribune Girls were equally adept at playing by both the women’s six-on-six rules being used in high school and college, and by the men’s full court five-player game. In their clashes with other independent teams, they mainly played five on five, which showcased Washington’s ability to dominate on both offense and defense. In one 1935 contest in front of an “overflow crowd” in Asbury Park, New Jersey, Ora Washington and the Tribune Girls defeated what was considered to be a local powerhouse, the “strong Tiger Girls,” by a score of 48-5. Women’s basketball coverage was sparse in most newspapers. This was the backlash era of girls and women’s basketball, when most colleges had succumbed to pressure to dismantle their intercollegiate varsity teams and replace them with non-competitive intramurals. Semi-pro teams sponsored by businesses filled the void and the Tribune, a black newspaper in Philadelphia, was among them. The Tribune Girls drew crowds and headlines most everywhere they went. The team’s owner, Otto Briggs, sought to capitalize on their popularity by scheduling road trips “out west,” which in those days meant the Midwest. The Tribune Girls usually made one trek each season to Ohio to challenge white teams from a strong, tri-state area league. A few of the Ohio teams reciprocated by coming to Philadelphia for at least one game a year. The undisputed star of this all-white Midwestern league was center Ruth “Susie” Sponseller, who played for the Leavittsburg Athletic Club. Stories about Sponseller always recognized her as “the best female basketball player in the world,” and she routinely scored more than half of her team’s points. Throughout her career there were whispers that Sponseller was really a man in disguise because of her muscular build and masculine mannerisms. But the Philadelphia Tribune Girls couldn’t have cared less about Sponseller’s lack of femininity. They weren’t exactly paragons of gentility themselves. Washington was described as looking like she’d been out picking cotton all day by one opposing player from the 1930s. “She looked like the worst ruffian you ever wanted to see,” said the opponent, a black college girl who played against her. The Ohio newspapers that regularly reported on the white women’s league games totally ignored the mixed-race exhibitions between Sponseller’s team and the Tribune Girls. But the short roundups in the black press hint at the epic battles waged on the court. Though Sponseller’s team won many of those exhibitions, the scores were always close and Washington always held her own against her taller, beefier rival. The Tribune Girls also traveled to the South to play independent teams and black women’s college teams. Black women’s colleges were under the same kind of pressure to dismantle their intercollegiate athletic programs in the 20s and 30s that white women’s college were, and many did. But a smattering of schools resisted the pressure to ban their women’s teams in the 1920s. Bennett College in Greensboro, North Carolina, was one of the progressive havens for black female athletes in the 1930s. In 1934, Bennett College went undefeated, soundly beating all the opponents they could find. They invited the Philadelphia Tribune team to campus in March of 1934 for the challenge of going up against the team everyone heralded as being the best in the nation. The games were staged at the Sportsarena in downtown Greensboro, a venue that was not usually open to “coloreds.” More than one thousand spectators crowded into the Sportsarena and the local white press sent reporters to cover the event. Players interviewed in 1996 about the games recalled being unsettled by all the hoopla surrounding the series, and also by the physicality of the Tribune’s play. The Tribune Girls showed up with two sets of flashy uniforms and changed from their red and white ones at halftime into gold and purple uniforms with socks to match for the second half. According to one Bennett player, the Tribune Girls passed around half-pint jars of corn liquor in the locker room, each player taking two or three swigs before heading back out to play the second half. Bennett lost all three games to the Tribune Girls. Recalling the games decades later, Bennett players were still marveling at the amazing, albeit rough, play of Washington. “I never saw her when she hit me, but she did it so quick it would knock the breath out of me, and I doubled over,” said Bennett center Lucille Townsend. 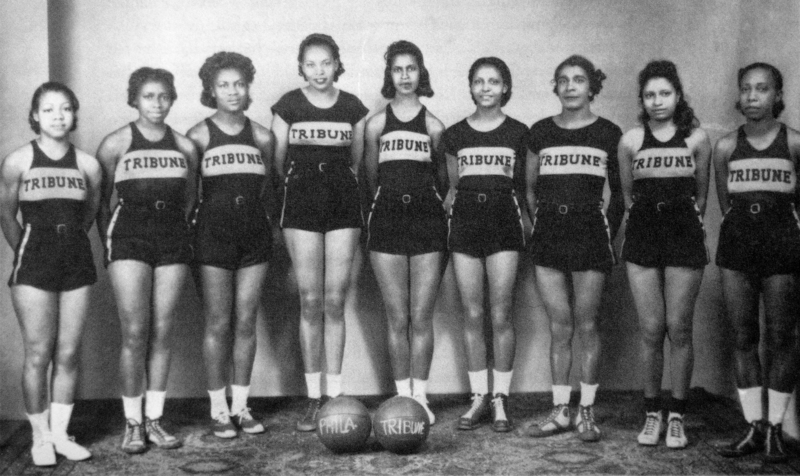 Ironically, the Tribune Girls and the Bennett College women’s program both disbanded at about the same time — in the early 1940s. The college finally succumbed to the pressure to replace intercollegiate athletics with intramurals and play days. The Tribune Girls disbanded soon after Washington retired in 1943. She continued to play tennis in the all-Black American Tennis Association (ATA), however. Washington won eight ATA National Crowns in women’s singles between 1929 and 1937. She also won every woman’s doubles championship between 1925 and 1936, and mixed doubles championships in 1939, 1946, and 1947. 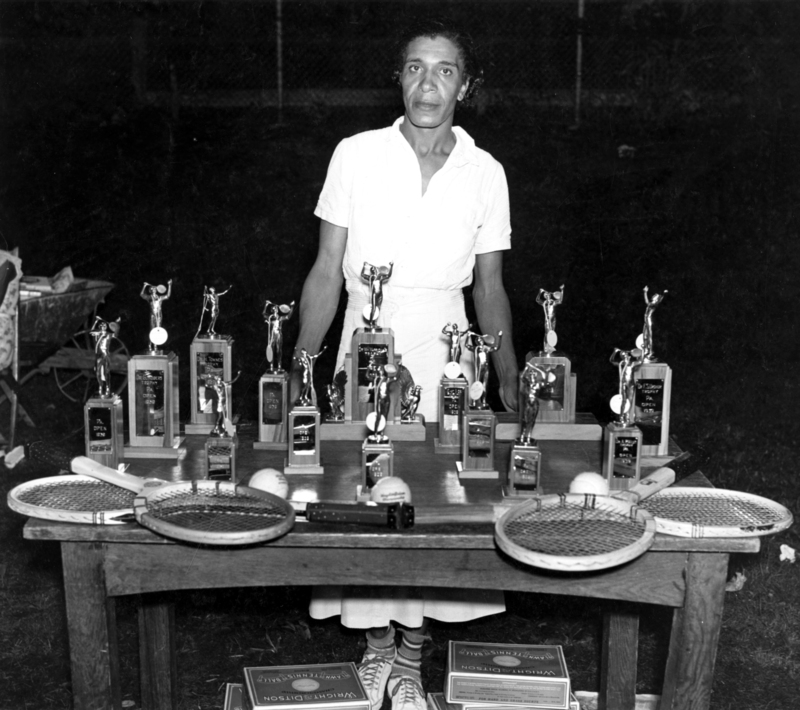 Ora Washington posed with some of her tennis trophies. Photo from Charles L. Blockson Collection of Temple University. Sadly Washington died in relative obsurity in 1971, five years before she was inducted into the Black Athletes Hall of Fame. She was inducted posthumously into the Women’s Basketball Hall of Fame in 2009. 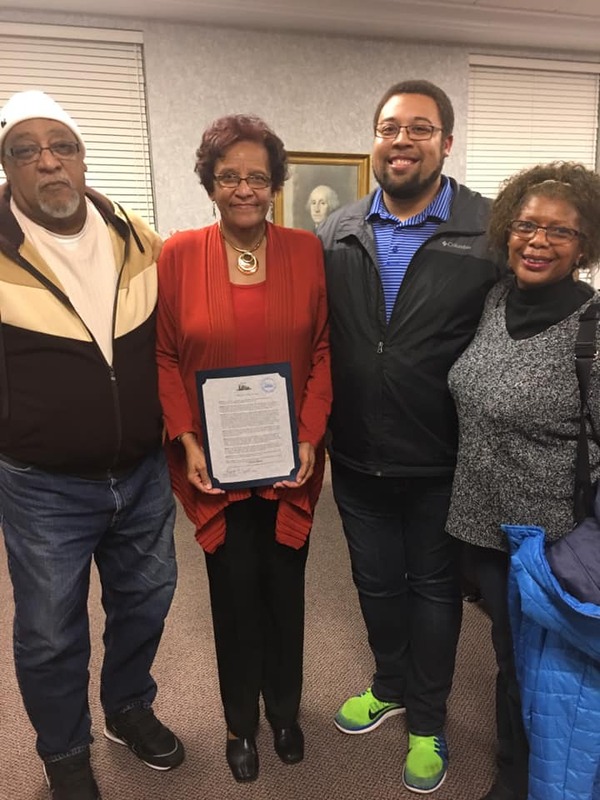 Thanks to the work of women’s basketball historian Pam Grundy and black basketball historian Claude Johnson, Washington’s name finally rose to the top of the pile this year and she is now rightly enshrined in Springfield, Mass, alongside the men and women who pioneered the game of basketball. 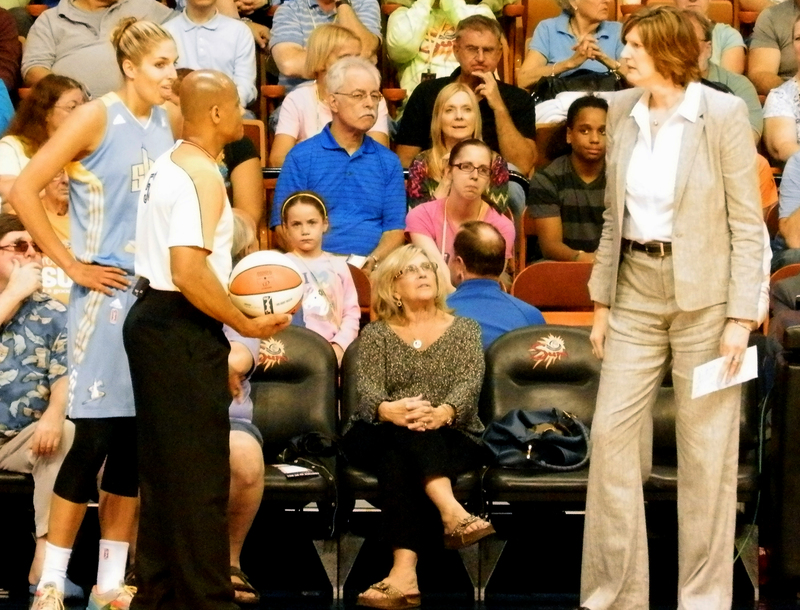 Anne Donovan, right, coached the WNBA’s Connecticut Sun from 2014 to 2016. It was a tribute to Donovan and a shout-out to the teammates Donovan and Manning, Maine’s hall of fame high school hoop star, shared during the two years they played ball together at Old Dominion University in the early 1980s. All of them, like Manning, were in disbelief that Donovan, only 56, had succumbed to heart disease. “I was shocked,” said Manning in a phone interview last week. She found out via Facebook when a former college teammate dedicated her page to Donovan. Later that day details were confirmed during a televised WNBA game. In many ways, Donovan and Manning were kindred spirits. When Manning went off to Old Dominion University in 1981 after her storied career at Westbrook High School, I was writing sports for the Portland (Maine) Press Herald. I remember talking to people who thought Manning was making a mistake. A shy, quiet kid off the court (but a fierce competitor without peer on it), some said she’d be better off closer to home. It was also wishful thinking for the many Maine women’s basketball fans who hoped she would head north to Orono to lead the UMaine women’s basketball program. But Old Dominion in Norfolk, Virginia, was the powerhouse of women’s basketball back then, having won a national championship in 1980. To be recruited by Old Dominion was a dream come true and a chance to see how good she could be against the best competition in the nation. 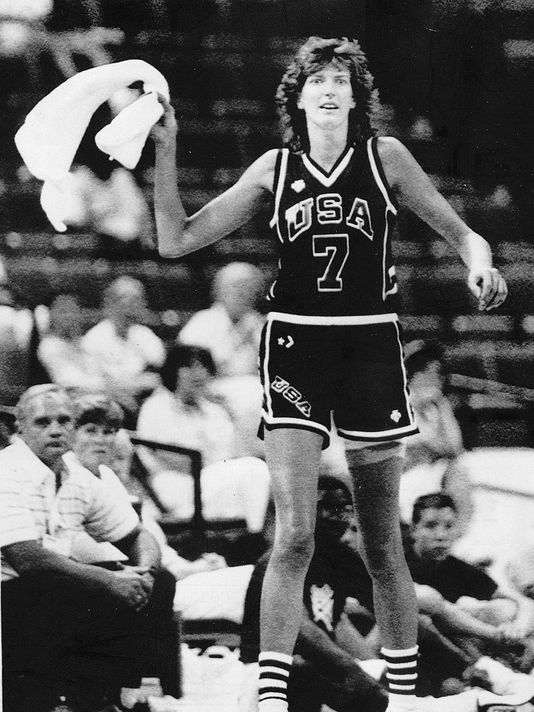 And for an admitted introvert like Manning, ODU was a place where the spotlight would not be shining quite so brightly on her, and instead would be focused squarely on star players such as junior center and everyone’s All-American, 6-8 Anne Donovan. Donovan too had been a shy, quiet kid as a high school star in Paramus, New Jersey. She led her high school team to state championships in her junior and senior year. She earned all kinds of accolades as a high school star and was recruited far beyond her home state. Like Manning, she had decidedly mixed feelings about all the attention paid to her. Her fierce competitiveness drove Donovan to leave her familiar surroundings to play at the highest level of the women’s game. As a freshman, Donovan led the Lady Monarchs to the AIAW championship and led the team in scoring, rebounding and blocked shots. In her four seasons at Old Dominion, she averaged 20 points, 14 rebounds, and 6 blocks per game. Those who followed women’s basketball back in the 1980s cite the times Donovan matched up against the Russian National team’s 7-2 foot powerhouse, Uljana Semjonova, as an indication of Donovan’s single-minded determination. Donovan was dwarfed and outmatched by the beefy Russian star in their first exhibition game meeting in 1980 and again in the 1983 world championships (The teams didn’t compete against each other in the 1980 and 1984 Olympics because of reciprocal, political boycotts). Donovan was quoted as calling herself a “fly on Semjonova’s shoulder” in 1983. But Donovan got her revenge in 1986 at the Goodwill Games in Moscow. She literally drew a picture to help her visualize herself blocking Semjonova’s shot. She not only managed to do just that, she also achieved averaged 11 points and 10 rebounds, as the U.S. sent the Soviets to their first international defeat in two decades. Back at ODU, Manning’s first memory of Donovan showed how respected she was by her coaches and peers and what an influence she could be on her teammates. It came before the team’s very first team meeting, to which Manning was a few minutes late. Hoping to slip into the room unnoticed, Manning recalls how Donovan came up to her the first chance she got and said, “You need to go apologize to coach right away.” Despite the sternness of that admonition, Manning knew that Donovan was simply taking her role as a team leader seriously and making sure everyone on the team was on the same page. 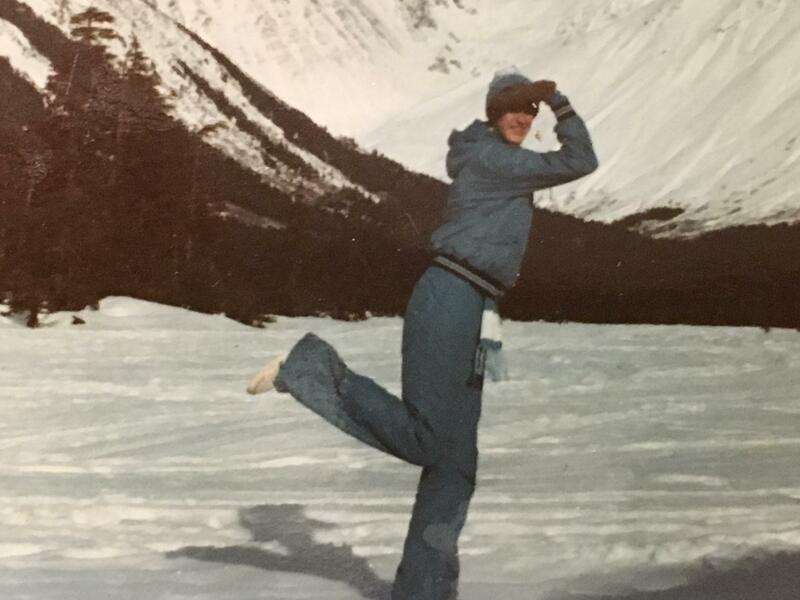 Anne Donovan on a team trip to Alaska, giving the ODU salute. After college, Donovan continued to put basketball at the center of her life — coaching at the college level and in the WNBA (where she became the first woman to coach a team to both a WNBA and an Olympic championship). Manning, meanwhile, played two more years at ODU. The Lady Monarchs won their first NCAA national championship in her senior year. Manning played one year of pro ball in Ireland before coming home to Maine, starting a family, and coaching her kids during their growing up years. She still coaches at the high school level. And she will always remember the lessons she learned from Anne Donovan. 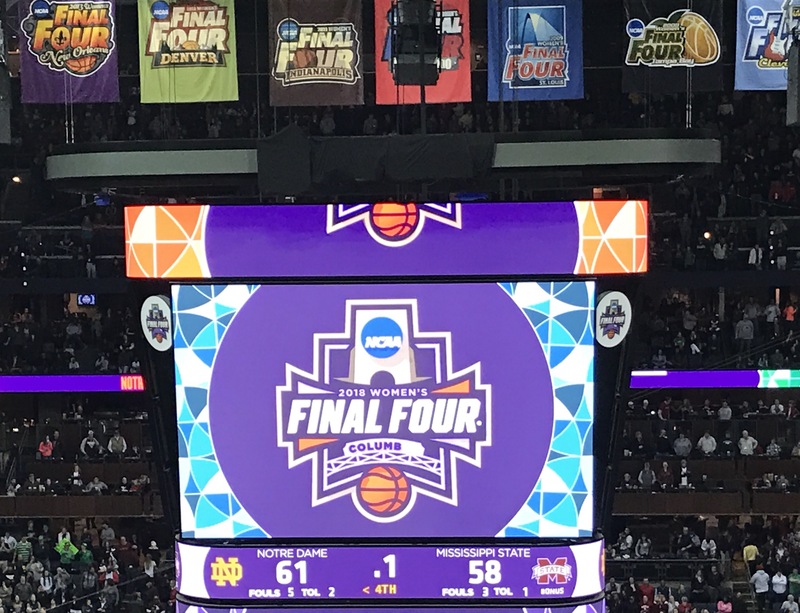 Banners hanging from the Nationwide Arena ceiling this weekend attest to the exciting 36-year history of the NCAA’s involvement in the Women’s Basketball Final Four. There have been some thrilling games over the years for sure. Most recently last year’s semi-final, in which Mississippi State ended UConn’s 111-game win streak on Morgan William’s buzzer beater, provided a shocking finish that looped on highlight reels even during the run-up to this year’s Final Four. Having witnessed a couple of Final Fours recently (New Orleans and Nashville) where UConn runaways made the final game anti-climactic, I’d decided to skip the trip to Dallas in 2017. But that Morgan William shot convinced me that I needed to be in Columbus in person in 2018. Just in case. Columbus, Ohio didn’t seem like an exciting venue for a Final Four, but the arena was packed, and the place was rocking for the semifinals Friday night. My thoughts went back to the first time the tournament was held in Ohio (Cincinnati in 1997). That was the first time I had ever attended the Final Four in person. My sister and I sat almost directly behind the Stanford bench and watched as Old Dominion provided the overtime heroics with a come-from-behind victory over Stanford, 83-82. Guard Ticha Penicheiro scored 18 points in that game, including the game-winning free throw. For the final game, we watched Pat Summitt coach the Lady Vols to a 68-59 victory from behind their bench. The Lady Vols came back from a first-half deficit to win that game with Chamique Holdsclaw (only a sophomore) scoring 24 points. The other notable thing about that tournament (besides it being the first for us) was the fact that all four coaches were women: Stanford’s Tara VanDerveer, Tennessee’s Pat Summitt, Old Dominion’s Wendyu Larry and ND’s Muffett McGraw, something local newspapers trumpeted as the wave of the future. This time around my sister and I sat high above center court in Columbus, and noted that McGraw was the only female hoping to coach her team to a national championship. Mississippi State’s Vic Shaefer, UConn’s Geno Auriemma, and Louisville’s Jeff Walz were all given more of a chance to win the national title than McGraw — mainly because McGraw’s squad would have to beat UConn in the semifinal to make it to the final game. Her team also had the shortest bench, having lost four players to ACL tears this year — including Brianna Turner, whose 263 blocks in the first three years of her career (not to mention the 14.5 points per game and 7.5 rebounds) had made her the biggest name at Notre Dame since Skylar Diggins had graduated in 2013. The UConn-Notre Dame game was the second of the night. Mississippi State had provided the heroics in game one, which featured 15 lead changes in regulation. Leading by 1 and with the ball, Louisville had scored an uncontested layup with only a few seconds on the clock. My sister turned to me and said, “They might regret taking that shot,” and sure enough, MSU’s Roshunda Johnson hit a huge 3-pointer to tie the score and send the game into overtime. There they dominated the deflated Cardinals and earned their spot in the Finals by a 10-point margin. When the second semi-final started, we didn’t give Notre Dame much of a chance, even after they went out to a pretty good 13-point lead at the end of the first quarter. But when UConn came roaring back and was actually up by 7 at the half, we decided to leave our balcony seats (and the incredibly obnoxious UConn fans in front of us) to find a better place to watch the second half. By the time we found our new seats (in the Elevator Restaurant down the street), Notre Dame had come roaring back to tie it. We and the other restaurant patrons watched on the big screen over the bar and roared as the Irish’s Arike Ogunbowale hit the game-winning shot to send UConn to defeat. Most women’s bball fans know the rest of the story. Another Arike Ogunbowale three-pointer gave Notre Dame the well-deserved championship against Mississippi State on Easter Sunday night. Many MSU fans bemoaned the officiating, but the officials missed a lot on both sides. Mississippi’s Teaira McCowan had gotten away with her share of travels on rebounds and put-backs in the post. As had been the case in all three games, the winner had to put aside all the distractions and make the big time shot when they needed it. That’s what the Fighting Irish did. Parity is a word that gets tossed around a lot when people complain about how women’s college basketball isn’t as exciting as the men’s version. But we left the arena, as Notre Dame was cutting down the nets, feeling as if we really had watched the best Final Four ever. It was Muffett McGraw’s 800th win and second national championship (The last one was in 2001). To say we were glad we were there to witness it is a bit of an understatement. That we’ll be in Tampa for the 2019 Final Four also goes without saying.